Accommodations for the 2014 EWCA conference 2014 are available in Frankfurt's various hotels as well as in several hotels within walking distance on the Polish side of the border. Please use the following informations to book your hotel.Note: we reserved a certain contingent in some hotels to special conditions, but they are only as long available as the rooms last - there comes no room-guarantee with the deadline. If you prefer to stay in Berlin: It is a one-hour-train-ride and the train runs about every 30 Minutes. Approx. 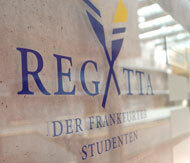 15.00 Euro/night (w/o breakfast), linnen and towels inculded, single rooms with private bathroom for students only! Booking will be possible only until March 31st, only with payment in advance to EWCA conference office. Please contact us directly.